I am yet to receive my LinkBricks for the castle, but last week was not completely void of LEGO activity. As I was building the 9444 Cole’s Tread Assault vehicle with my son (he got it as a present), I thought of how many special pieces were involved. Of course there were lots of Technic bars and axles, but also purpose-molded things like the front cannon and the head and tail of Skales. Only some smaller pieces and plates were what one might call normal LEGO bricks. Before embarking on a diatribe about how things used to be better, a discussion I had with my father got me thinking: LEGO has always had special pieces, no matter how much the brick-build purist might protest and long for times gone by. 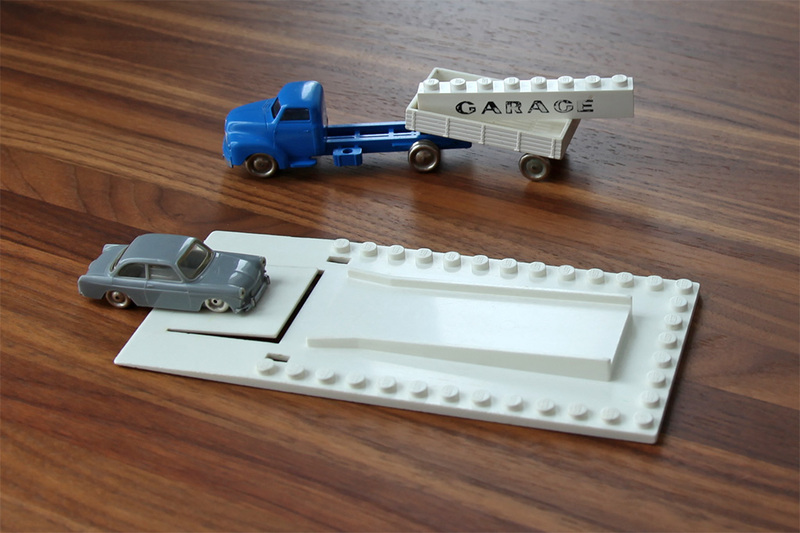 As I had recently written about LEGO from 1960s on this blog, I asked my father which particular sets he had as a child – since all I have are the pieces without context. He was quite adamant that the only thing he ever had were generic brick sets and individual cars, although thinking about it he admitted that perhaps he has forgotten some token set. I then showed him some scans from 1960s LEGO catalogs and that jogged his memory a bit. The best guess still is that all or most of his old LEGO came from generic brick sets or basic sets (TLG, the LEGO Group, certainly sold many such sets back then), but what is interesting are the things he did remember clearly: the town board that went under the buildings and the garage baseplates with automatic doors. TLG introduced the predecessor to the 1970s LEGO Town (and current LEGO City), in 1955. Early sets appeared under the System i Leg umbrella moniker and by 1958 a Town Plan sub-theme was clearly established. The theme lasted until 1966 and its cars until 1970. Most of my inherited LEGO are compatible with Town Plan, since they are from the early 1960s. The town boards and garage pieces (as well as the small doors and windows) were key components of Town Plan, there were a few different types of each. Both were what we might now call special pieces, not unlike cannons or Skales’ tails. Unfortunately my father’s town board never survived the 1960s. Those original town boards were not like current baseplates with roads. In fact, they had very little to do with actual LEGO bricks at all, since they were not really studded, but merely printed pictures of town lots and streets. The garage baseplates did survive, but their doors are missing. The garage doors were quite interesting according to my father: when you drove a car over the flap on the front of the baseplate, it would bend and release the door. The rear-heavy door would then swing up and open. Pretty cool, but also very purpose-molded. Speaking of purpose-molded, the rest of Town Plan was actually even worse: the cars, the trees and the traffic signs of the day were not compatible with LEGO bricks at all, and didn’t even have symbolic stud-prints on them, they were simply meant to stand freely on the printed town board (as were the flat-bottomed garage baseplates). In a way, parts of Town Plan resembled more miniature railway accessories than LEGO. At least the current 9444 Cole’s Tread Assault cannon and Skales – and even modern LEGO mice – can be connected to standard bricks.